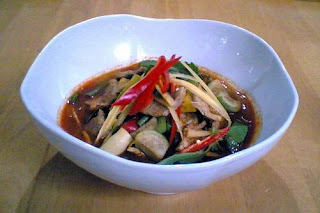 "Jane" my darling has asked for a recipe of "Gaeng Bpah" a week ago, hence this curry. 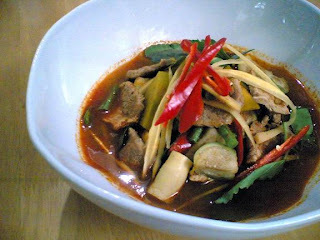 This curry is a very good diet as it's very healthy: with loads of vegetables and without coconut milk. I personally find the dish is best served at lunch as it's too hot for dinner (especially with the holy basil). The Tip for cooking "Apple-Eggplants" is to soak them into a Saline (Water containing significant concentration of salts.) before cooking in order to prevent them from turning into black colour. 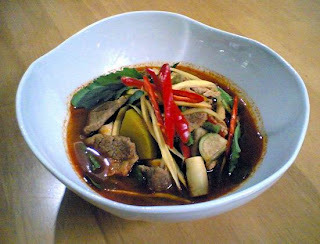 Find below a recipe of "Kaeng Pah Moo" or in other words "Jungle Curry". thank you thank you thank you sweetheart!! !